Lana Del Rey on the cover of Grazia France, July 2017. 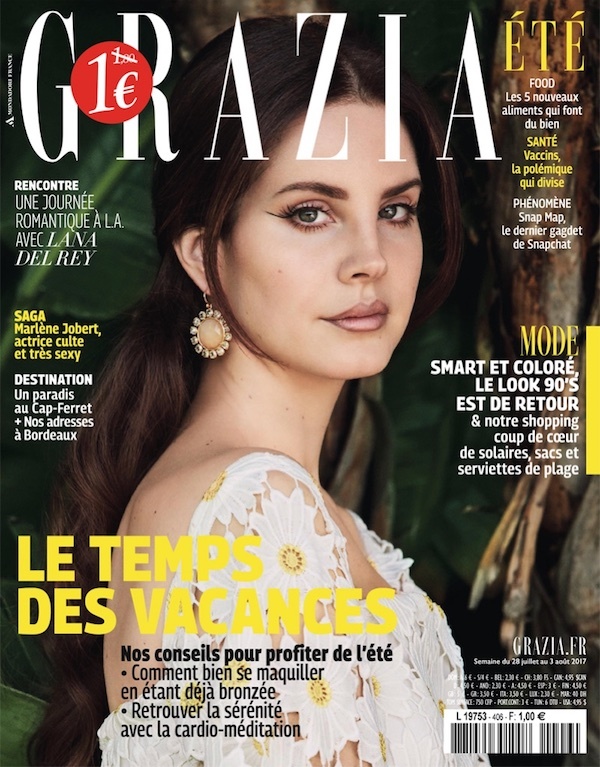 Lana Del Rey features on the cover of Grazia France’s July 2017 issue, in a summery floral photoshoot photographed by Hilary Walsh. MusicListen: Lana Del Rey performs 'Honeymoon', 'High By The Beach' and 'Terrence Loves You' live. MusicListen: Lana Del Rey’s new song 'Coachella - Woodstock In My Mind'. MusicLana Del Rey - 'Freak' music video. MusicLana Del Rey on the cover of Dazed, Summer 2017. MusicLana Del Rey releases new song 'West Coast'.